Cholesterol is a substance naturally made in the liver which performs a number of important bodily functions. These include the production and function of hormones and keeping the cell walls flexible. Although cholesterol is necessary, having too much of the substance can cause a number of potentially serious complications and can increase the risk of heart disease. Fortunately there are a number of dietary and lifestyle changes that can help reduce your cholesterol levels. Essential oils may be better known for their external benefits but certain essential may also be useful in reducing cholesterol levels naturally. The dangers of high cholesterol are well-known and very serious. It is important that you get your cholesterol levels checked on a regular basis and do what you can to reduce your cholesterol levels to a normal level. High cholesterol can lead to a number of serious and potentially fatal complications including heart attack and stroke. Chest Pain : When the coronary arteries are affected, it can lead to chest pain or angina. Heart Attack : When plaques rupture or tear, it can lead to the formation of blood clots which can block the blood flow or plug flow to the heart. It can also cause arteries downstream to become plugged. When the flow of blood to the heart is stopped, it may lead to heart attack. Stroke : Strokes occur when blood clots block the blood flow to your brain. First of all, it is worth pointing out that not all cholesterol is the same. You have probably heard of ‘good’ cholesterol and ‘bad’ cholesterol but what exactly does that mean? Cholesterol is transported through the blood attached against proteins. The combination of cholesterol and protein is referred to as a lipoprotein. The different kinds of cholesterol are identified by what is carried by the lipoprotein. LDL Cholesterol : Low-density lipoprotein is the bad kind of cholesterol. It moves cholesterol particles through the body and accumulates on the walls of the arteries making them harder and narrower. HDL Cholesterol : High-density lipoprotein is often referred to as the ‘good’ type of cholesterol. HDL cholesterol gathers up excess cholesterol returning it to the liver. There are a number of potential factors that contribute to high cholesterol. Some of these like diet, obesity and lack of exercise can be controlled. Unfortunately, there are also factors which can not be controlled like genetic factors. An Unhealthy Diet : Food high in saturated fats and trans fats can increase cholesterol levels. Foods high in cholesterol include red meat, eggs and dairy products. Obesity : Being obese can increase your risk of having high cholesterol. People with a BMI greater than 30 are especially at risk. Inactivity : Not getting enough exercise also puts you at risk of high cholesterol. Exercise can boost the level of HDL – the good kind of cholesterol. It can also increase the size of LDL cholesterol particles making them less harmful. Smoking : Smoking cigarettes damages the blood vessel walls which makes them prone to fatty deposit build-up. Smoking might also reduce the level of HDL cholesterol. Diabetes : High blood sugar levels contribute to high levels of VLDL cholesterol and also damages the arterial lining. Age : Your risk of high cholesterol increases with age. The liver is less able to remove cholesterol as we get older. While studies to date are limited, certain essential oils may help reduce cholesterol and boost your heart’s health. If you are trying to reduce your cholesterol levels, then the following essential oils may help. It is important to note that these essential oils should never be taken internally unless they have been properly diluted and are available in capsule form. Cinnamon essential oil can stabilize blood sugar levels, reduce inflammation and help fight infection. Studies into the effects of cinnamon on cholesterol have so far been very positive. While the study looked at the effects of cinnamon extract, it is extremely likely that cinnamon oil would have a similar effect. Research on animals has also found that basil essential oil could be an effective remedy for high cholesterol. Lemongrass essential oil is rich in citral and geraniol and is another excellent oil lauded for improving blood flow and potentially reducing cholesterol levels. It helps keep the blood vessels dilates which allows blood to flow more smoothly around the body and according to evidence that it may also help reduce cholesterol levels. Clove essential oil is especially well regarded for its ability to relieve pain and inflammation but it may also be an excellent choice of oil for both regulating immune function and improving blood circulation. Lavender essential oil is still one of the most popular essential oils as well as being one of the most diverse of all this gentle acting oil is used for a host of emotional and physical purposes helping to calm the mind and heal the body. Ginger essential oil has a warming sensation when applied to the skin and is well-known for its antioxidant effects and ability to relieve pain and inflammation. Because of this, ginger essential oil can also help boost the circulation of blood around the body and may help reduce cholesterol levels. Oregano is a popular kitchen herb with a number of health benefits. The herb is also used to produce an essential oil with an array of excellent benefits. Oregano essential oil contains arginine and omega-3 fatty acids which are known to reduce cholesterol levels as well as triglycerides in the blood. To treat high cholesterol, you should only use oils available in the form of capsules, the oils should be labeled ‘standardized extract’ meaning they have been diluted and made safe for internal use. Makes sure that you read the manufacturer’s instructions carefully. Rotating the use of your essential oils may be more effective. Try changing oils every few weeks. Monitor your progress by getting your cholesterol levels checked every few months. Make sure that you only take essential oils internally under the guidance of a health professional. Which essential oils are best for lowering cholesterol? A number of essential oils are good for the heart. They can help improve the flow of blood through the body and reduce the risk of blood clots. Studies have found that a number of essential oils can also have a significant effect on cholesterol levels. Some of the best include cinnamon, basil, lemongrass, lavender, ginger and clove essential oil. As well as the essential oils mentioned in this article, there are a number of other ways to help reduce your cholesterol levels naturally. If your high cholesterol levels are linked to a poor diet, it is important that you eat a more healthy diet. Reduce the consumption of saturated fats and trans fats and increase your intake of fiber and fresh foods. Try eating food rich in omega-3 fatty acids which have been linked to a reduction in cholesterol levels. What lifestyle changes can help reduce cholesterol? As well as eating a healthier diet, there are certain other lifestyle changes that can have a positive impact on high blood cholesterol. Try getting more exercise. If you have been inactive for a long time, then start slowly but try to do at least 30 minutes of exercise a day. If you smoke, it is important that you quit since smoking can damage the arterial lining and also reduce your level of HDL cholesterol – the good kind. Drink alcohol in moderation only. The moderate intake of alcohol has been linked to an increase in HDL cholesterol but drinking heavily increases the risk of many diseases including heart disease and stroke. Essential oils can be extremely beneficial but it is important to use them correctly. Do not ingest essential oils unless you have spoken with your doctor in advance. Essential oils are extremely powerful and should never be ingested undiluted. In fact, even using diluted essential oils internally can cause unwanted side effects so great care should be taken. Pregnant women and breast feeding mothers should avoid using essential oils internally. Essential oils should also be diluted well in a carrier oil before applying them topically. 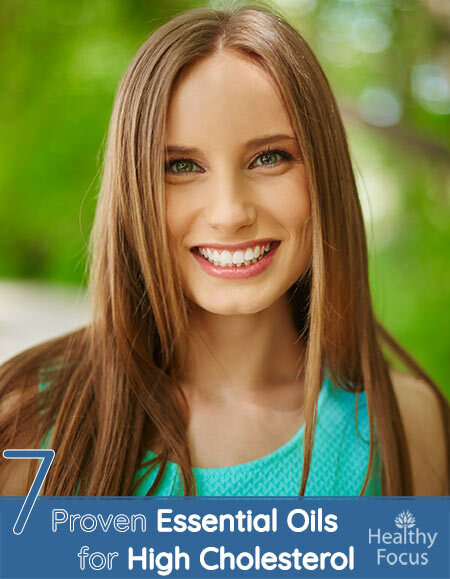 While essential oils may be best known for their their ability to calm the mind and treat the skin, they also have a number of potential internal uses. Studies have demonstrated that certain essential oils can improve blood flow, reduce cholesterol and improve your heart’s health. Please be aware that taking essential oils internally can be dangerous. It is important that you speak with your doctor before trying to treat high cholesterol levels with essential oil.